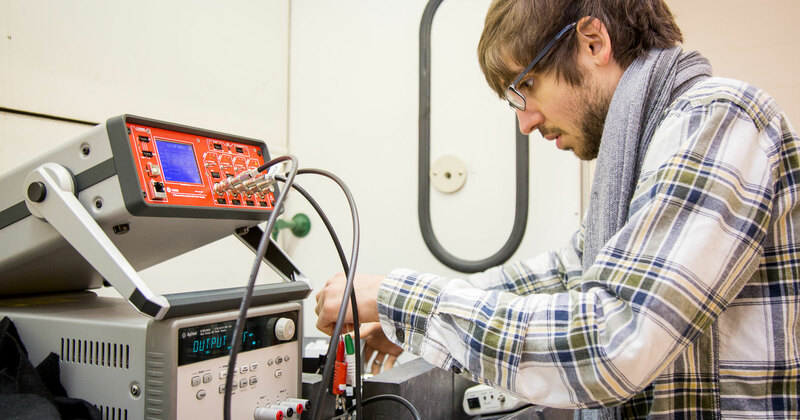 Graduate Student Steven Czyz works in the Oregon State Radiation Detection Lab. Two College of Engineering students recently took top honors at the national American Nuclear Society (ANS) Student Conference and another won the 2018 Innovations in Nuclear R&D Award sponsored by the U.S. Department of Energy (DOE). Nuclear engineering graduate student Steven Czyz meanwhile won the DOE award with his paper “A Prototype Detection System for Atmospheric Monitoring of Xenon Radioisotopes.” Czyz has developed a prototype radioxenon detection system at Oregon State that uses lower cost materials than traditional radioxenon detectors. These detectors are used to verify underground nuclear weapons tests in support of the Comprehensive Nuclear-Test-Ban Treaty. After graduation, Woods plans on heading to a national lab for further computational physics work. “I have been applying for postdoc positions at some national labs to perform computational research in high energy density physics applications,” he said. Brumback is looking toward the analyst route in nuclear and energy policy. “I want to take part in the discussions happening and help shape the directions of our state and federal energy policies,” he said. Czyz, meanwhile, hopes to pursue a career in academics. “I want to be a professor one day!” he said. “Professors are always learning, always teaching, and always trying new things, and I want that to be me one day. I want to be the one that can provide an answer to the question of "Well wait, why don't we try this?"